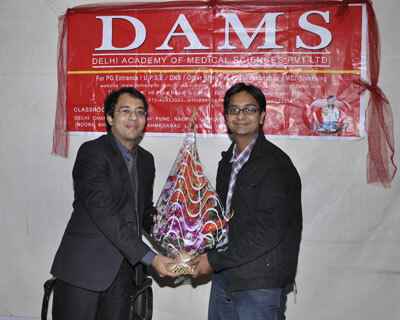 DAMS: Congratulations on securing a rank in AIIMS 2010. What is the secret of your success in this exam? Dr Saransh Jain: Their contribution cannot be described in words the parents and my sister gave me in my times emotional support was key to my success and my friends. With whom I studied and cribbed about. DAMS: Which books did you read MCQ? Which revision books were the most productive and which were least? Dr Saransh Jain: AA & MK. Anatomy subject will Gobind Garg for Pharma. DAMS: How important think was DAMS in your preparation? Dr Saransh Jain : DAMS laid my foundation in 2007 (I joined the foundation course) and kept my revision up to date in 2010 (when I joined Test and discussion). DAMS: What do you think is the better way of preparation between selective intensive study and wide, extensive study? What did you chose as your style of studying. DAMS: Indian PG entrance are highly competitive so to compete them students end up in appearing in multiple PG exams, kindly extend your views on this and also their pros and cons of appearing in the multiple PG entrances. DAMS : What was your strategy for the exam day? How many questions did you attempt and why?